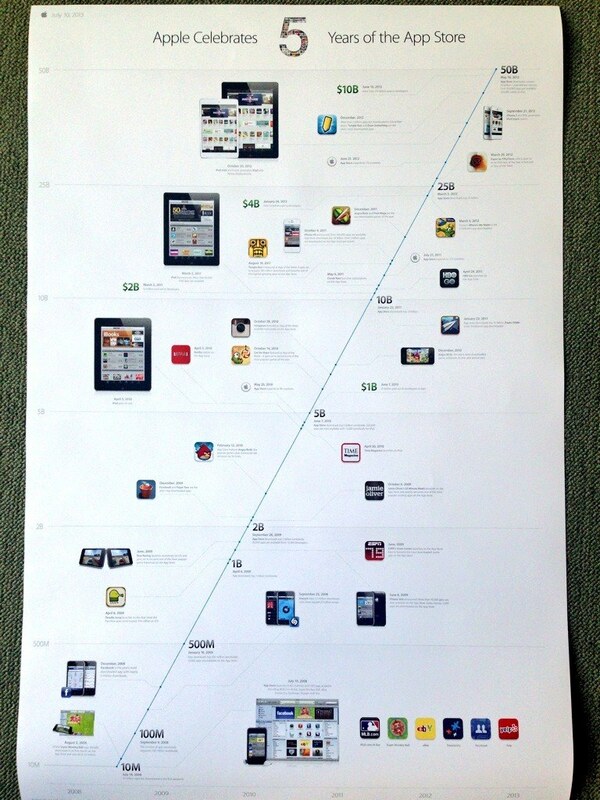 Tim Bradshaw, a tech reporter with the Financial Times, received this poster from Apple celebrating the upcoming 5-year anniversary of the App Store. The App Store, which originally launched on July 10, 2008, has seen more than 50 billion app downloads across nearly a million individual apps. Apple sent a similar promotional item to reporters to celebrate the 10th anniversary of the iTunes Store, though that version included a gift card redeemable for 100 songs hand-picked by the iTunes staff. Ironically when Jobs first described apps for the iPhone they were all going to be Webapps and would be run online. People complained about them not being native. Had this process been more widely adopted we'd all live in a platform agnostic world of HTML5 apps without a walled garden. Instead people complain about how Apple locked everyone in, stifled innovation and copied Android. Make your minds up. Where can I see this in high res? Any reporters out there who dont want it let me know! How many are in the trash? Nice poster :) All for something Steve Jobs initially likely didn't want. It's amazing when you consider that Steve Jobs didnt initially want third party apps on the iPhone. Amazing to see a concept get such quick adoption. It doesn't even seem that long ago we didn't even have cell phones.